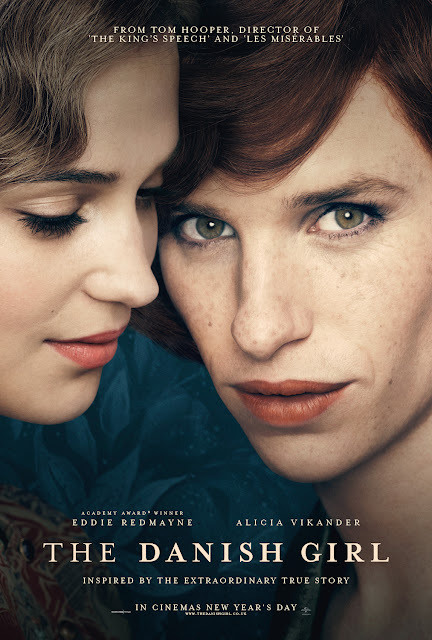 The official movie poster of "The Danish Girl" starring Eddie Redmayne was recently released online, where a close-up view of transformed Eddie Redmayne is seen cheek-to-cheek with so-star, Alicia Vikander. In "The Danish Girl" movie, Eddie Redmayne (The Theory of Everything) cross-dressed for the role to tell the controversial life of the world's first transgender, Lili Elbe (born as Einar Mogens Wegener), and how his life made a full 360 degrees when he decided to become a woman way back in the 1930's, when people are a little more conservative and not-so open-minded about the topic. The movie will open early next year and may be shown in the Philippines sometimes on the third week of January 2016 or in February. Below is the official movie poster of "The Danish Girl"
*See the first-look photos of Eddie Redmayne as the "Danish Girl" here. Below is the official movie trailer for "The Danish Girl" starring Eddie Redmayne. Enjoy!